When invading its haunts one is impressed with the vigorous personality of the male. He nervously raises his alarm with a variety of scolding, interrogative chirps and chattering notes and his dark inquisitive eyes sparkle with excitement through the black masks. He darts with nervous animation from place to place, then disappears in the dense cover only to appear again to denounce the intrusion. 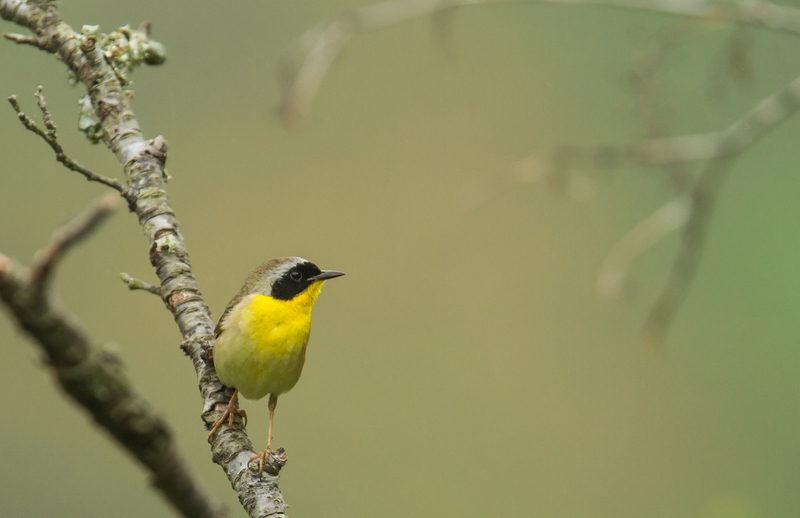 Just last weekend, I mentioned to a friend that I have yet to get a decent image of a Common Yellowthroat, despite seeing them frequently on birding outings. While I will keep trying for a better photo, I am happy that at least one of these beautiful warblers has decided to come by the garden while I was prepared with appropriate camera gear. I say one, but it is possible there have been a few different individuals cruising through the neighborhood, based on what appear to be some subtle differences in the distinctive black masks of the males I have photographed the past few days. 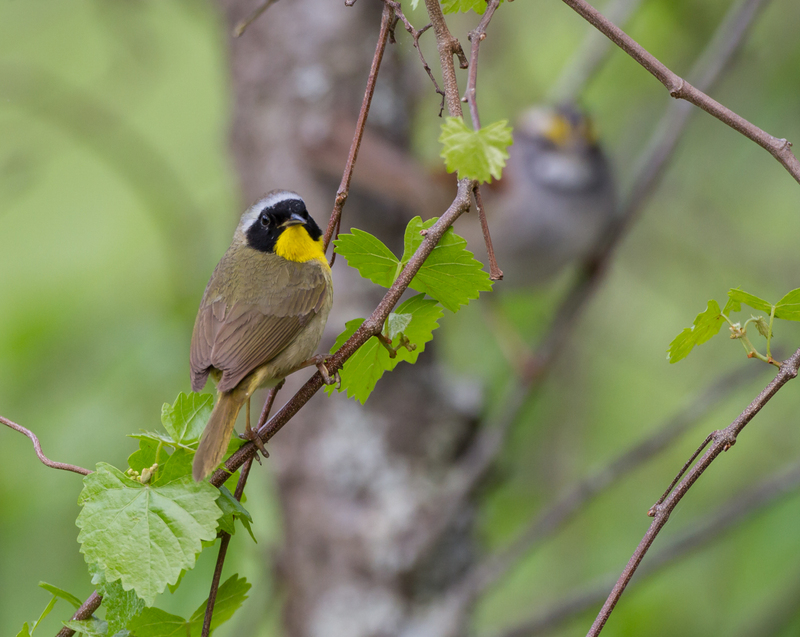 I have seen only one of the much more drab-colored female Common Yellowthroats in that time, and only for a few seconds, before she darted off, portrait-less. 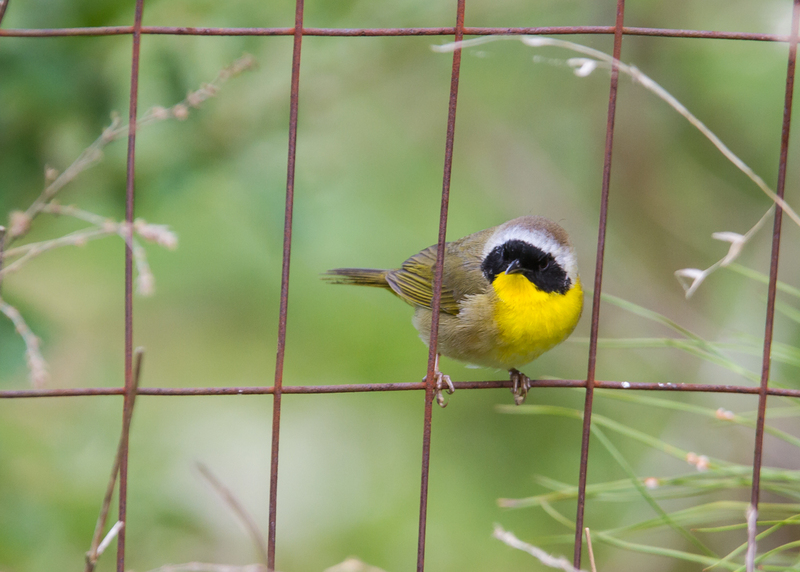 Male Common Yellowthroats are readily identifiable by the yellow throat and bold, black mask, edged in blue-gray. That black mask and their nervous, fidgety behavior, make me think these little guys are always up to something. At the garden, I usually see them hopping from twig to twig in some of the bushes bordering the fence. 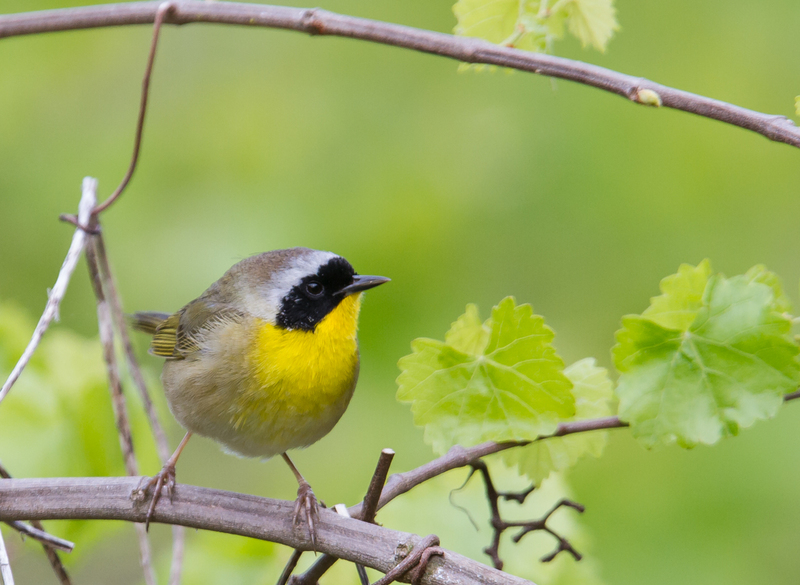 They often move down the fence row, going back and forth through the mesh, and end up in the tangle of grape vines at the corner, before flying off. On average, they are probably only with me for one or two minutes in any one visit. If I am out there long enough, one might make another appearance a couple of hours later. 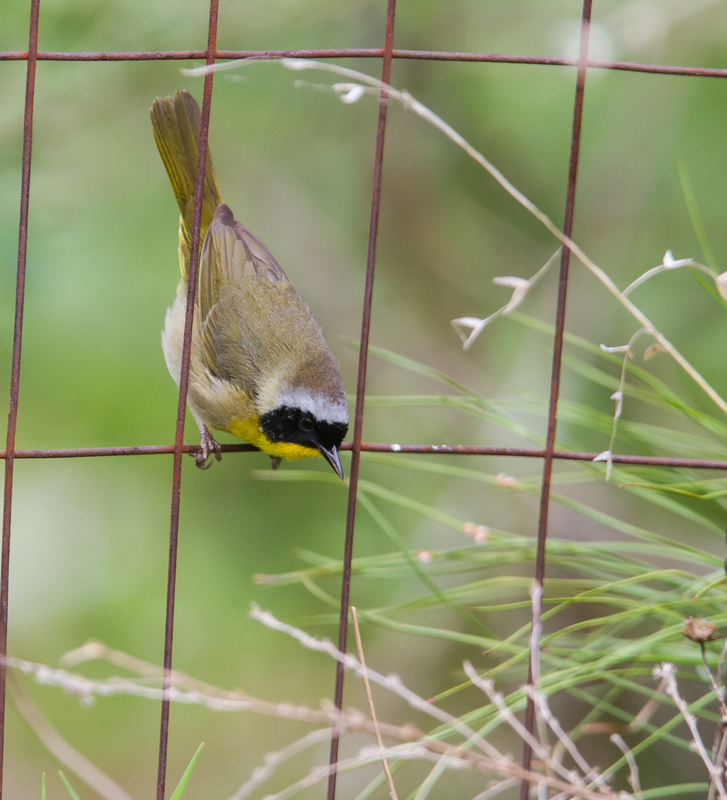 They are a bird of the tangled grasses, twigs and vines of brushy habitats, often near wetlands. Their distinctive witchety-witchety-witchety call is often heard before the birds are seen. They will readily pop up for a quick look if you pish or squeak on the back of your hand in appropriate habitat. 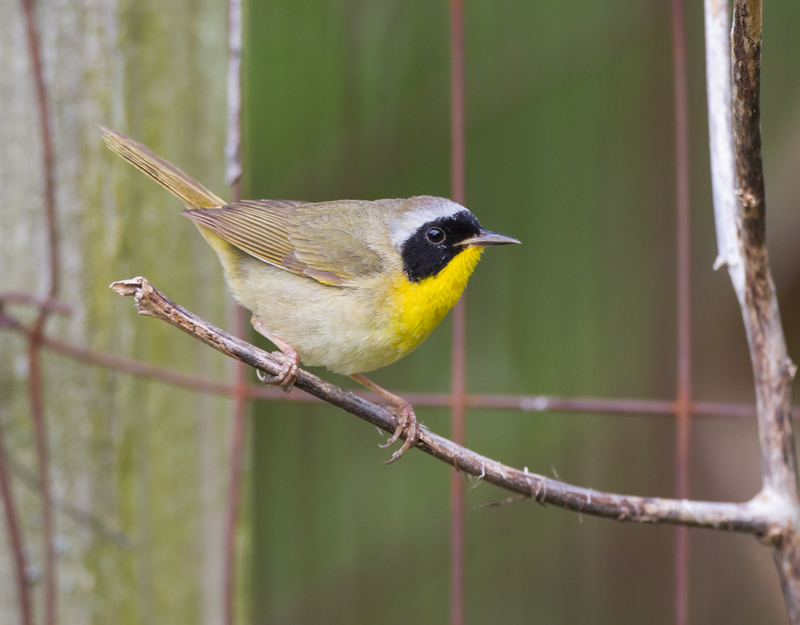 Common Yellowthroats are believed to be one of the most widespread breeding warblers in the United States and probably occur in all 100 counties in North Carolina. Their nests are usually low to the ground in the fork of blackberry bramble or some other tangled location. I usually see them in the garden area most often in the spring. Once the nesting season is in full swing, I think they spend more time further down the power line, where the creek crosses through a huge patch of tree saplings, grasses and blackberries. A tough place to penetrate for we humans, but I hope to spend some time down there this summer, watching for the witchety bird as it goes about its daily routine. 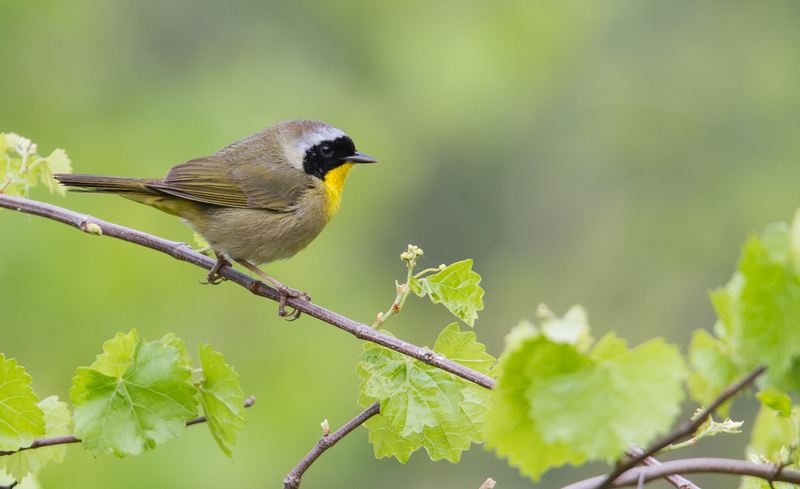 This entry was posted in Natural History and tagged common yellowthroat, garden birds by roadsendnaturalist. Bookmark the permalink. I have never seen this warbler so thanks for posting.